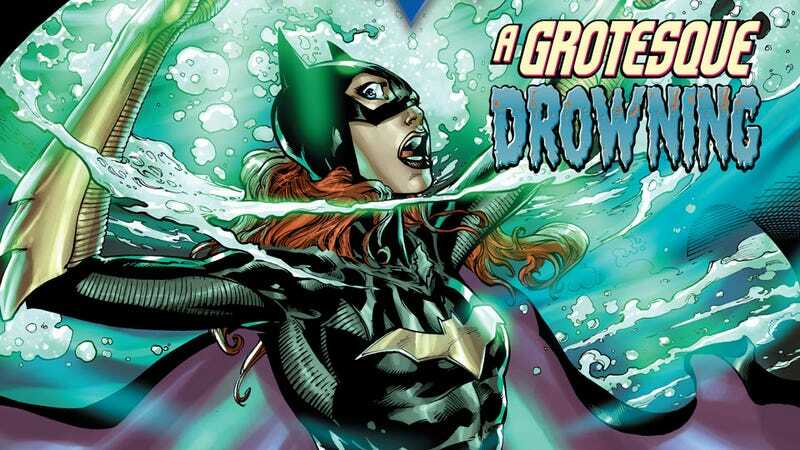 Back in action years after being crippled by the Joker, Batgirl's biggest problem in DC Comics' New 52 reboot seems to be all the men in her life worried about her getting hurt again. Batwoman doesn't have to deal with this crap. After a tense confrontation with Batman in issue #6, writer Gail Simone explores a different side of the tragedy that unfolded in the pages of The Killing Joke, which ultimately led to Barbara Gordon's lengthy stint as Oracle, the wheelchair-bound information specialist for the superhero set. Along the way she'll have to deal with the gentleman killer Grotesque, who only wants to help her learn to breathe underwater. I kinda miss Oracle. She got parodied (oh wait, that wasn't parody?" in Smallville, played a starring role in the short-lived Birds of Prey television series and served as a role model for those similarly handicapped. Judging from these three pages, getting out of the chair might have been a big mistake.